We had a great 2017 season enjoying the wildlife, persuading Shearwater in and out of tricky spaces and generally having a blast with our passengers so now as we tidy up the winter paperwork we’re turning our attention to 2018. We will continue to run jet boat trips for the 2018 season while we discuss plans for the business and / or the boat with interested parties. Could this be your adventure? We love the water, we love our jet boat and we love Pembrokeshire’s wildlife and coastline. The business was built on us sharing that with our passengers so we’ve always done all the skippering ourselves – we are literally and figuratively at the helm of the business. In a world where power boat trips are now very popular we have a unique boat so we can offer a genuinely unique experience. The business has been designed to be flexible and whilst we have generally worked from St Davids work needn’t be confined to St Davids. Venture Jet could easily be reworked to reflect new owners / skippers to take it forward but that is a decision for the next jet boating generation 🙂 . The key question for anyone considering taking the business on is ‘Would it work for you, with your skills and interests and the lifestyle you want to achieve?’. So What Does it Take to Run a Jet Boat Business in Pembrokeshire? The business would naturally suit people who love to be at sea. You’ll need an appropriate skipper’s license, relevant experience and training not just in how to handle jet boats (most skippers in the UK naturally have limited experience with them) but how to take those unique handling abilities and apply them in Pembrokeshire’s beautiful but often challenging waters. Local knowledge is essential for skippering but if you don’t know the waters you’ll enjoy getting to know them! We are happy to provide as much or as little support both in terms of the boat – particularly maintenance and handling, local waters etc – and the business side of things. You could of course bring in someone to skipper for you – most businesses do in this area – in which case we can work with them to familiarise them with the boat and the working environment. 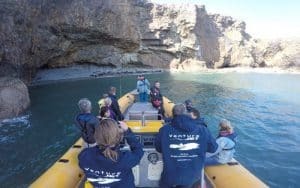 We’ve run Venture Jet very much as an outdoor activity as much as a wildlife tour but there’s plenty of scope for developing things to suit your own interests (commercial workboat work, safety cover, film and dive charter as well as further passenger work). 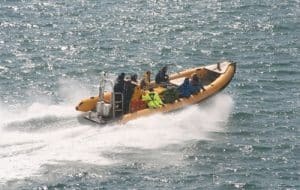 While Venture Jet is built around our passion for Pembrokeshire and Ocean Dynamics jet boats, it is a business and it has the work and challenges of any business. If we hand the business over then the new owners will be able to hit the ground running because it’s already set up and ready to work for them. We love being our own boss and this business does give us an unusual amount of freedom and flexibility, with the huge bonus of a much loved jet boat to go and blast away the paperwork cobwebs 🙂 . Thanks to our passengers the business has grown more than we ever expected it to – very quickly Venture Jet grew to the point that it needed us both full time, with additional help during the season. It is still a lifestyle business in that we really do get to play on a jet boat but it enables us to make a realistic living doing something we love. In recent years we’ve shortened our season to May to September (rather than March / Easter to October half term) to enable us to do other things in the shoulder season and over the winter. Passengers would be delighted if someone were to make jet boat trips available for a longer season. We’ll be happy to discuss options for developing work during and outside the passenger season in Pembrokeshire and elsewhere with any eventual new owners.